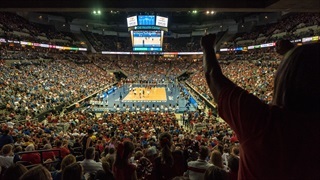 Nebraska has struggled to develop new rivalries since moving to the Big Ten, but something special is growing between the Huskers and Creighton Bluejays on the volleyball court. No. 7 Nebraska battled back from an 0-2 hole to take down No. 14 Creighton in five sets in front of an NCAA regular season record crowd at CHI Health Center Omaha on Thursday night. Check out all the photos from Nebraska’s comeback win over Creighton in our photo gallery by photographer Eric Francis. Nebraska DS Hayley Densberger and Creighton OH Jaela Zimmerman went 82-11 together at Malcolm High School. Thursday night, in Omaha, they'll be on opposite sides of the net. The weekend was a bit of a let-down for football fans, but Coach John Cook was in a good mood at his weekly press conference after the volleyball team took care of business at the Ameritas Players Challenge.